"First I want to thank you for all your support and great responses. After a few days on the countryside I could take (sic) some decisions . Running is in my blood and I decided to continue competing. My announcement in New York was my first reaction after a disappointing race. When my knee is better again I will start focussing (sic) on my next race. Thank you again for all your support!" 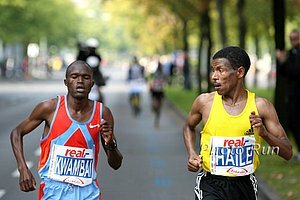 - Haile Gebrselassie confirming via Twitter that his retirement is officially over after one week. Additionally, his coach says he thinks the 37-year old Gebrselassie can compete until he's 45. Haile G's Back!! Everyone can relax, as the retirement lasted all of one week. Additionally, more good news was revealed as his coach thinks he can compete until he's 45. Can anyone say 2016 Rio? Video story in Armharic here (updated with translation from an LRC visitor).